YOU would be hard pressed to find a shorter boundary in world cricket than the straight at Eden Park. Built primarily as a hunting ground for the All Blacks, the venue's straight boundaries are only about 55m away from the centre of the wicket. Those are the kind of dimensions that leave batsmen licking their lips. 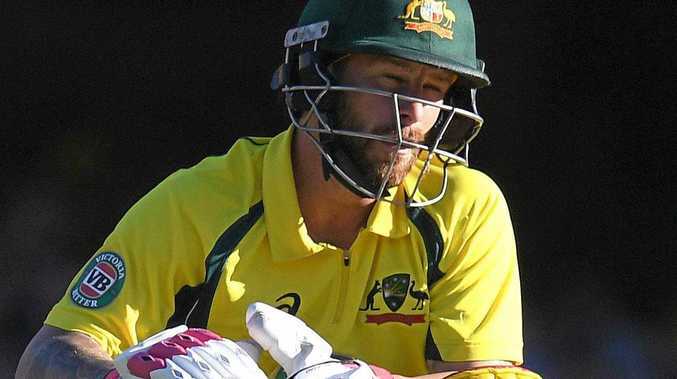 But Australia's interim captain, Matthew Wade, has warned his batsmen to tread carefully at the Auckland ground on Monday when they take on New Zealand in the first of three one-day internationals. "Looking at the small boundaries you assume really high scores but it is quite difficult," Wade said ahead of the first match of the Chappell-Hadlee Trophy. "And it tends to swing here. That's something you've got to get through, the first 10-15 overs are crucial. With the line-up that we play, if we can have wickets in the shed at the back end then we will score a lot of runs at the end of the (innings)." The keeper found out the perils of taking on Eden Park's small boundaries when he played at the ground for the first time last February, caught at cow corner trying to heave Corey Anderson over the ropes. The Australians were all out for 148 on that occasion, with the Black Caps' seamers running riot on the way to a 2-1 series win. It was a similar story a year earlier, with the Aussies skittled for 151 in a World Cup clash that the Kiwis only won by a wicket. At the same time, Eden Park's unusual dimensions have resulted in big scores before. Although the tourists failed to pass 150 last time around, New Zealand posted a score of 8-307 in the same game. Indeed, before Australia's innings that day, seven of the last eight innings at the ground had gone past 280 runs. "(The Eden Park pitch) just has a bit in it," New Zealand veteran Ross Taylor said. "I don't think there is a par score, some wickets here are 300, some are 200. "You just have to analyse it as quickly as possible, whether you're batting or bowling." The Kiwis were trounced 3-0 in Australia when the sides met in December, but Wade is expecting a tougher time on New Zealand's turf. "We played them in Australia (on) big grounds (with) long boundaries. It's a completely different ball game," he said. "(On) the smaller grounds (in New Zealand) they'll still play aggressive; they're still going to be able to hit plenty of fours and sixes at grounds that they play at. "They play well here (in NZ) and they play this venue very well. "We like to think we're hard to beat in Australia and it's the same when we come here - we expect a hard challenge over the next three games but we've got a young squad and we're excited to go out and really have a crack at it." Captaining the side for the first time, Wade maintains his job is simply to continue the fine work of the leadership duo of Steve Smith and vice-captain David Warner. "I don't think for me personally it's about putting a stamp on the team," he said. "It's about driving the values and the game plan that we have in one-day cricket moving forward. "Steven and David have put their stamp on the team, it's just about me keeping on driving those key messages through to the players. "We've performed really well in one-day cricket over a long period of time so it's not about trying to change too much - it's about keeping the ball rolling."